Development along the Las Vegas Strip corridor has commercial real estate brokers salivating at the opportunities in the industrial, office and retail sectors in 2018 with renewed interest from investors coming into the marketplace. That was the message from brokers speaking at the Palms at a seminar on 2018 investment sales hosted by Southern Nevada chapter of CCIM. 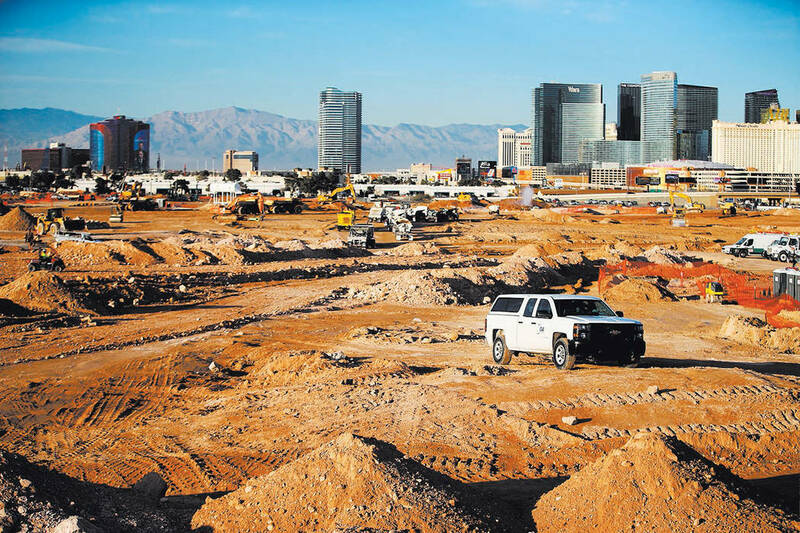 The top 10 projects under construction or planned for Las Vegas total more than $13 billion. There’s $1 billion for the Project Neon transportation project; $1.4 billion of the Las Vegas Convention Center expansion and renovation; $1.9 billion for the Raiders domed stadium; $1.5 billion for Wynn Resorts Paradise Park; and $4 billion for Resorts World Las Vegas on the north Strip. The retail vacancy rate stood at 8.1 percent at the end of 2017, the lowest level in nine years, according to Applied Analysis. While the office vacancy remains high at 18.7 percent, the lowest since the fourth quarter of 2008 at the beginning of the recession. Industrial remains the strongest sector with a vacancy rate of 7.4 percent to start 2018. Jones said the average age in Las Vegas has decreased over the last decade and having a “younger employment group” is a good sign and bodes well for more opportunities investors are looking at Southern Nevada along with the arrival of pro sports in the NHL and Oakland Raiders in 2020. More than 1.3 million square feet of office space was absorbed in 2017, an increase of 14 percent over 2016, according to Applied Analysis. It’s the most since 2007. Las Vegas added about 6,600 employees in the professional and business services sector in 2017, which resulted in more space being absorbed. “The Golden Knights and Raiders have had a physical impact on people as they view our market,” Jones said. “They feel like we’re a real community, and that there are other things to do here other than go gamble at a hotel-casino,” Jones said. Jones said “it’s going to be a strong 2018,” and she cited how there’s more commercial product “coming out than I thought we saw a year ago” at the same time. Charles Moore, senior vice president of capital markets and investment properties in Las Vegas with CBRE, said that in 2017 there were 20 retail properties that sold for more than $10 million. There were 21 such properties for industrial and 36 in the office sector that sold for more than $10 million. Moore used the Cheyenne Corporate Center as an example of what has happened in the marketplace. In 2005 when it was 92 percent leased, it sold for $77 million. During the recession the vacancy rate fell to 35 percent, and the owners offered free rent and concessions to attract tenants. In 2017, it sold for $38 million when leased at 60 percent. “That shows you where the market has been and the highs and lows, but now we’re starting to stabilize,” Moore said. Brendan Keating, CEO of Logic Commercial Real Estate, added that “2018 is going to be a solid year,” and cited how the north end of the Strip is “going to be on fire,” in the next couple of years with Resorts World and other casino projects. That’s going to help “take us to the next level,” he said. Keating said there’s expected to be $3 billion to $5 billion of government-funded projects such as the stadium, convention center and Project Neon. The investors buying commercial properties “are coming from all over the place,” Moore said. The company that purchased Cheyenne Corporate Center was Southern California-based Hertz Investment Group that owns properties across the country. Jones said investors are looking at different markets where they can generate a return rather than the primary locales where they have properties. “They’re looking for secondary market, and Vegas is the secondary, and were seeing a broader base of investors coming because they can get better returns in our market,” Jones said. Keating said California buyers in particular are finding that as their cap rates stay below what is available in smaller populated areas, there will be a “flow of capital downhill” to Nevada. In 2006, sales were twice the replacement cost, he said. Applied Analysis reported that 386,100 square feet of anchored retail space finished construction, bringing total inventory to nearly 54 million square feet. Office construction activity fell to 633,400 square feet at the end of 2017, which is down from 2016. The firm reported 4 million of industrial space is underway and more is in the planning stages. Jones said lenders continue to underwrite conservatively on the Las Vegas market with office the last one to come back and lenders to get more comfortable. The amount of equity required is higher than prior to the recession at 30 percent to 50 percent. In a rising interest rate environment with the Federal Reserve trying to fight inflation, Keating said assets and rental rates will appreciate and people will buy commercial real estate to have protection against inflation. “As the cycle goes forward, people are going to be more comfortable that the recession is in the rearview mirror,” Keating said.